A Touch of Class provides the thrill of professional live music in all forms; soloists, ensembles small and large and bands of all sizes and genres, all to help provide the perfect music for your event. Finding and managing live musicians can be challenging. We take the work out of your hands so you can enjoy a stress-free event! Our goal is to help you find the best possible music within your comfortable budget range. From the smallest individual performance to the largest production, we have it all. Since 1980 A Touch of Class Music has been helping Colorado couples turn their wedding ceremony and reception visions into reality. Custom design your day with your styles of music, the instruments you want and the size of ensemble or bands you desire, and we make it happen for you. Trust the knowledge and experience of A Touch of Class to help you create true music magic on your day that you will remember forever. From traditional to modern, A Touch of Class will help you find the perfect music for your prelude and ceremony music. We offer talented soloists on piano, guitar, harp, violin (or most any instrument), amazing ensembles from duo to trio to quartet, or even full orchestras. We are happy to play any music you desire or, if you prefer, we can help you make every selection. A Touch of Class offers the full range of musical artists for your cocktails and dinner party. Classical, jazz, current hits, bluegrass, country, cultural or any style played by exceptional soloists, small ensembles or full bands and orchestras, in Denver and throughout all of Colorado. Let us take you through some options to help you find the perfect music for your celebration! When it’s time to kick up your heels and dance, A Touch of Class is there to provide the ideal ensemble or band for your party. We work with most every artist and band in Colorado, so we have hundreds of options to choose from. Trust us to help you provide your family and friends with a night they will never forget! In all our years we have worked with some great Denver DJs and are happy to provide you with the versatility and flexibility that a great DJ offers. For those times when a DJ is the perfect choice, trust A Touch of Class to help you find the best! A Touch of Class has been helping companies and planners produce fantastic events since 1980. Fast, friendly and affordable, we will help you find the perfect musician, ensemble, band or artist to create the ambience and the party you seek. We work with only the very best in Colorado, we make it easy for you by taking the work and worry out of your hands, and we help you provide your guests with an event that they will not forget! From the newest, hottest young talent to the most seasoned veterans, A Touch of Class works with the finest professionals in Colorado to provide you with incredible live music for any event, large or small. Soloists, ensembles and bands, we have it all. Since 1980 we have seen the best (and the worst) DJs in Denver. Trust us to provide you with a DJ who will fit the profile, personality and music style you seek. Versatile and affordable, a great DJ can make a great party! A Touch of Class provides lots of specialty entertainers that can help make a unique and memorable event. Comedians, magicians, face painters, balloon and caricature artists, look-alikes, living statues–if you can imagine it, we can probably provide it. Let us help you add some fun and magic to your next event! Founded in 1980 by professional violinist, Tracy LaGuardia, A Touch of Class is one of Colorado’s best known, most respected and most called upon sources for incredible live performances. Drawing from their list of hundreds of professional Colorado musicians, A Touch of Class has the resources to provide the highest quality performers; soloists, ensembles and bands. A Touch of Class musicians are symphony performers, private music teachers, music school teachers, university professors and even doctorates in music! Dozens of Denver agencies and planners trust A Touch of Class Music to provide quality, professional musicians, live bands and DJs for their most important clients. Join the experts who know and trust A Touch of Class with the music for any wedding, party or special event! Learn more about founder Tracy LaGuardia. Your performance was fantastic and your voice was breathtaking. Every complement we received regarding the wedding and reception began with the music. We firmly believe that you “made the wedding”. Thank you so very much. Thank you so much for helping complete our fairy tale wedding. Your “touch” really did add class to our big day! You were a pleasure to work with and your performance was simply perfect. Thanks to a Touch of Class! – All our best. Thank you so very much for providing such lovely music for our wedding reception. You truly did add a touch of class and so many of our guests commented on how much they enjoyed the atmosphere you helped to create. You were such a pleasure to work with – thank you for making that part of it so easy! Many thanks for your beautiful music. Your singing and violin playing were incredible and deeply felt by everyone at the wedding ceremony. Your music was expertly performed and flawlessly timed and paced. Your musicianship was of the highest caliber! Tracy LaGuardia is a native of Colorado Springs and has been a professional musician for over 35 years. A private teacher and former public school music teacher, Ms. LaGuardia received her Bachelor’s Degree in music education from The University of Denver in 1985. 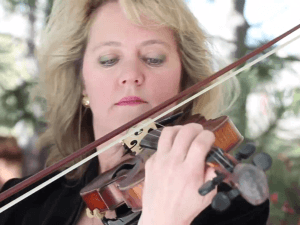 Tracy has played the violin & viola for over 45 years, and is a vocalist both as a soloist and in many different performing groups, and has performed with countless national acts. Ms. LaGuardia has been concertmaster of The Littleton Symphony, The Rocky Mountain Chamber Orchestra, and is currently the concertmaster of The Arapahoe Philharmonic. She has also performed with The Denver Symphony, The Colorado Springs Symphony, The Cheyenne Symphony, The Longmont Symphony, and many others. She performs with several classical ensembles, country bands, jazz groups, rock groups (electric violin & vocals), and manages one of Colorado’s most respected entertainment agencies, A Touch of Class Music, which specializes in providing world-class musicians for weddings and private events.